'Tis the season for grilling, and 'tis the season for fresh asparagus. 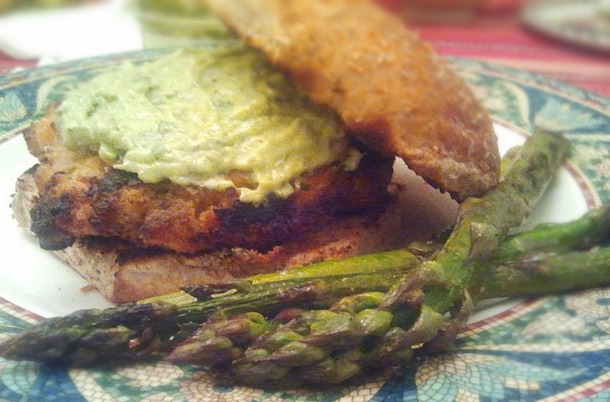 This meal is a perfect pairing of a light burger made of fresh salmon with farm fresh asparagus that you grill in tandem, making the meal quick and easy. A couple things to note, fresh ingredients is key. Invest in good salmon. Fishy salmon will make for a stinky burger. 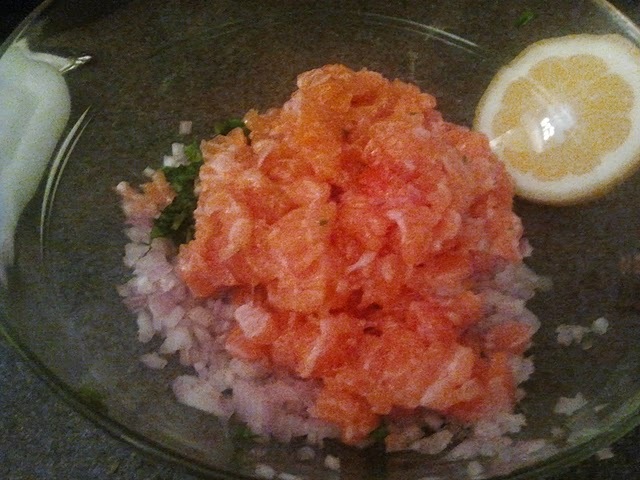 I know, my husband died a little inside when I asked him to mince up these gorgeous salmon steaks from the fish market. But when he took a bite of the burger, I think he made peace with it pretty quick! 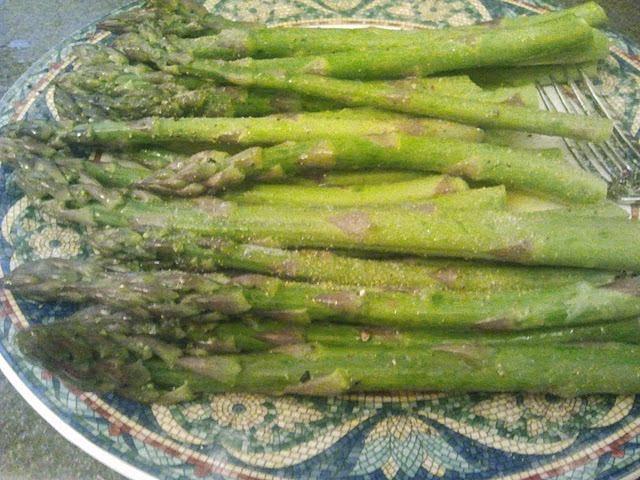 Fresh goes for the asparagus as well. These in the pictures were a gift from my friend who gets them fresh from Michigan at the farm stand, it doesn't get better than that (BTW, thanks again KP!). 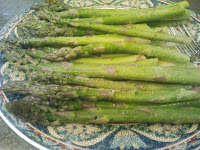 If the asparagus look dried out on the ends or have dried out tips, go for a light salad instead or grill some other vegetable in the same way. When cleaning asparagus, just take the ends in one hand and the tops in the other, and snap. 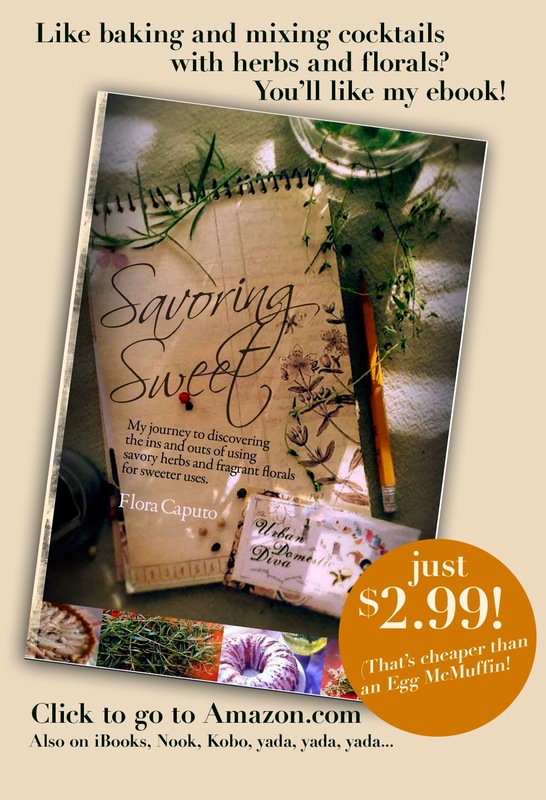 The tough ends will naturally snap off from the tender part. The fresher the asparagus, the shorter the end. So be careful not to take too much off. Finally, a word of caution. My hubby and I have seen others make salmon burgers and basically make salmon "slurry". 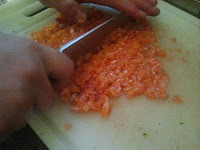 I recommend that you mince the salmon by hand as shown in the picture we provide. When you get to mashing it all up with a fork with the other ingredients, it gets to be the right consistency. 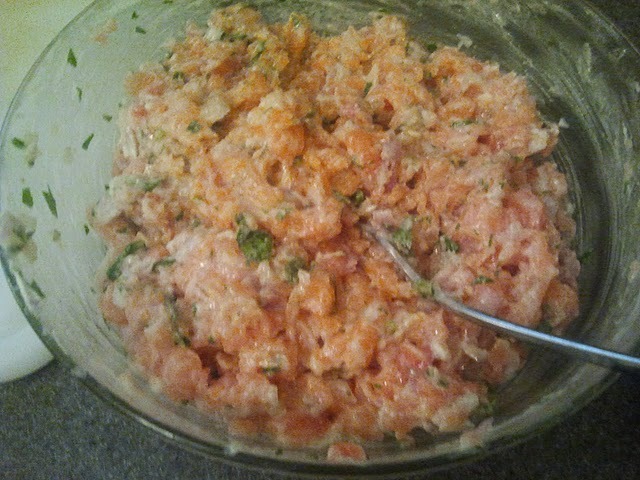 If you put salmon in a food processor or blender, I think the flakiness of the fish gets destroyed, and if you are not careful, you can overdue it in a big way and make salmon soup instead. Take the time by hand, its worth it. Happy Grilling! Add the lemon juice, shallots and parsley to a medium bowl. Chop then mince by hand the salmon steaks, and add to the shallot mixture. 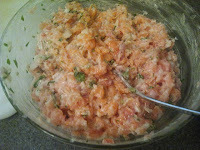 Using a fork, add the softened butter and work into the salmon. 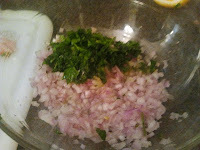 Add the salt and pepper, and other spices, and mix again with a fork until evenly distributed. 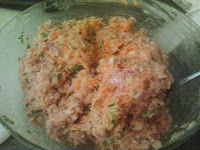 Add the bread crumbs, and mix with the fork until well combined. 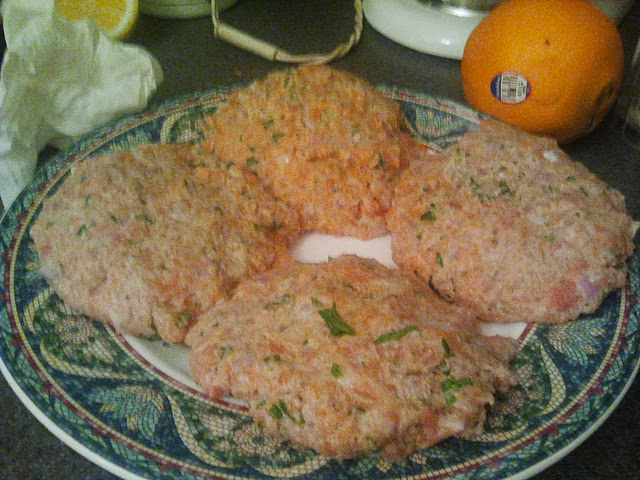 Shape into 4 large patties. Let sit in the refrigerator to firm up for 30 minutes to an hour. Meanwhile, drizzle the asparagus with the remaining half a lemon, olive oil, salt, pepper and garlic. Let sit until burgers are ready to grill. When grilling, you may want to use a grill basket for fish for the burgers and a vegetable basket for the asparagus. If not, just be careful when flipping and maneuvering over the grates. 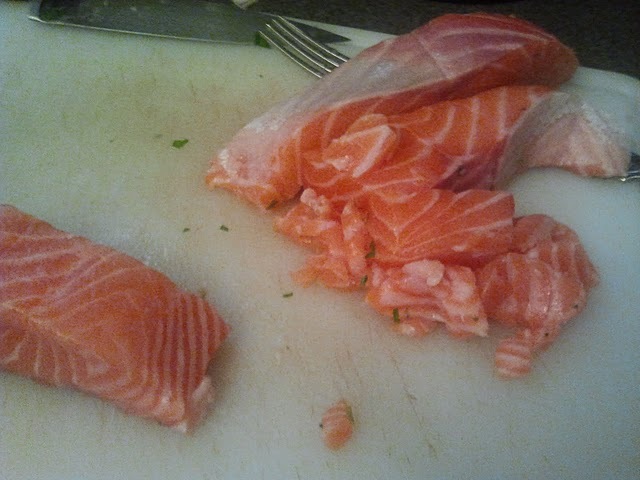 The salmon has a lot of fat, so be careful about over browning them too soon without having the centers cooked. We cooked ours on indirect heat for a bit, then put them on more direct to finish off. They go pretty fast, 2-3 minutes on each side. Same with the asparagus. While burgers are resting, mix the pesto and mayo together in a bowl. Serve the burgers with a dollop of the pesto mayo and other garnishes (like lettuces, onions, tomatoes). You may want to toast the buns on the grill, too. 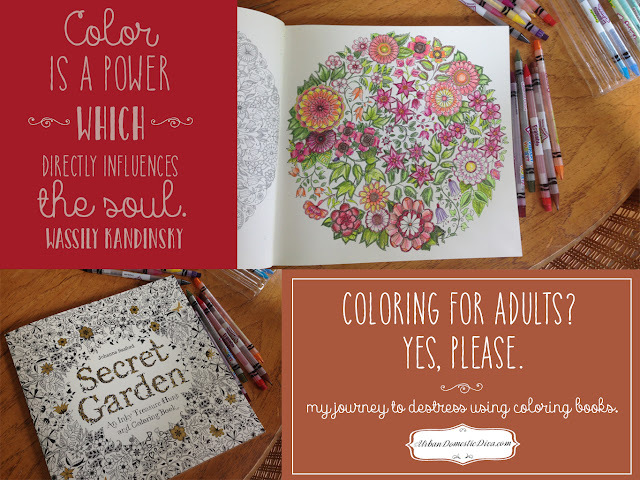 I have to tell you even our 8 year old liked them, so they are kid friendly! A nice way to sneak in some fish into your child's diet. 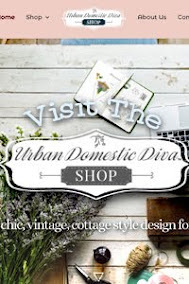 COOKING: Recipe Round-Up, Memorial Day!